Last week I shared some recent food truck adventures I had in Austin, Texas at The Mighty Cone and Hey Cupcake. But how could I go to Austin and only visit two food trucks? After hearing Lawman-in-law speak glowingly of G'Raj Mahal, there was no way I was leaving Austin without giving it a try. Fortunately, it was also one of my hostess' favorite trucks, too, and she already planned to take me there. Sweet! G'Raj Mahal is an Indian food truck that's really more of a food truck complex--the cooking truck is surrounded by heated seating tents. The menu at G'Raj Mahal has an impressive array of Indian dishes to appeal to vegetarians and carnivores alike. We hit it up on a Saturday night so naturally there was a wait. I took the time to study the menu, but was getting no where. Everything looked so good. A frantic text to my brother-in-law yielded some guidance...go Goan! So I chose the Rechaad Masala with shrimp and a side of garlic naan on the side because you can never go wrong with garlic naan. The plump shrimp were swimming in a fiery, sweet and tangy tomato sauce that had more than a hint of lemon. It was legitimately hot and awesome. I've never had Goan food, but I'd definitely be open to trying more if this sample of one dish is indicative of the cuisine. 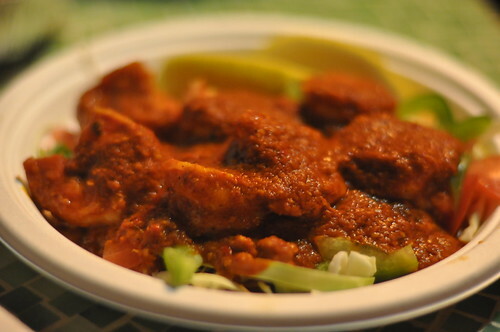 Whenever I get Indian in the city I usually order family-style (and let's be honest, I usually get it with my family, so they have to put up with me stealing bites, it's part of being related). 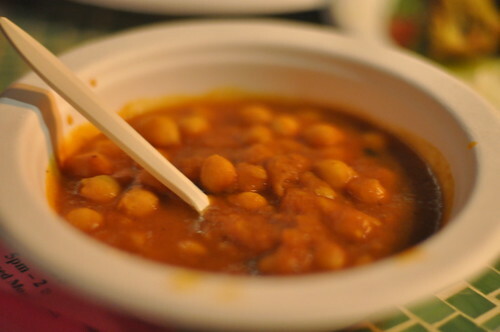 I was dining mostly with a primarily vegetarian crowd but the food was plentiful so I was able to get a few bites of both the chana masala and the mushroom masala. As you'd expect, both were a good bit more mild than my dish, but delicious nonetheless. I'm a big chana masala fan--it's high on my list of things I want to learn to cook, especially since my husband recently bought two flats of chickpeas from Costco. This was my first time having mushroom masala and I have to say mushrooms plus curry is a genius combo. 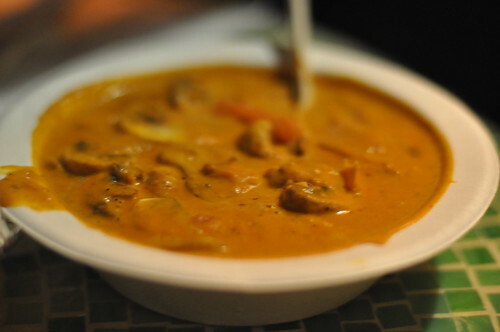 Mushrooms are perfect flavor sponges and masala sauce is was rich, creamy goodness. If you find yourself in Austin with a hankering for Indian food, definitely check G'Raj Mahal out.